The poster boards are 120 by 120 cm, so your poster can be any size that is smaller than that. The posters should be mounted on the first day in the Wolfswaardzaal and will remain on display for the entire conference. Materials to mount the posters will be provided. 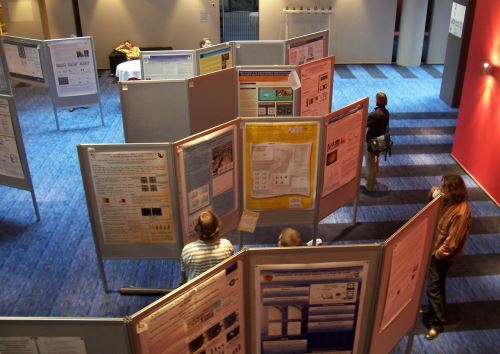 There will be a special poster session during which authors will stand by their posters to answer questions. Computers and projectors (with VGA connections) will be available in each room. The computers will all have Office 2013 installed and will be running Windows 7 or 8.1. Please copy your presentation to the computer in the break before your session. It will also be possible to use your own laptop if you are showing software. If you have special requirements please contact info[at]measuringbehavior.org. All oral presentations (with the exception of tutorials) are 20 minutes including questions. Speakers should therefore plan to finish a few minutes before their 20 minutes is up to allow time for questions. Session chairs will keep strict time to allow delegates to move between parallel sessions. The best student paper will get an award. You can download the Program Book here. Delegates will also receive a printed copy.